Do your employees know how your company makes money and operates as a total business? Do they make the right decisions that drive the best results for your company, clients, and shareholders? Can they hold a business dialogue with senior leaders at your company? In today’s volatile business environment, employees at all levels need to understand how the systems of business work together to generate revenue, profit, and shareholder value… all while recognizing how their actions and day-to-day decisions impact the drivers of success. 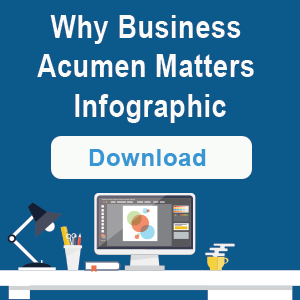 To help your employees understand how a business makes money and achieves its goals and objectives, Advantexe has developed a virtual eLearning solution called Business Acumen 101 (BA101). 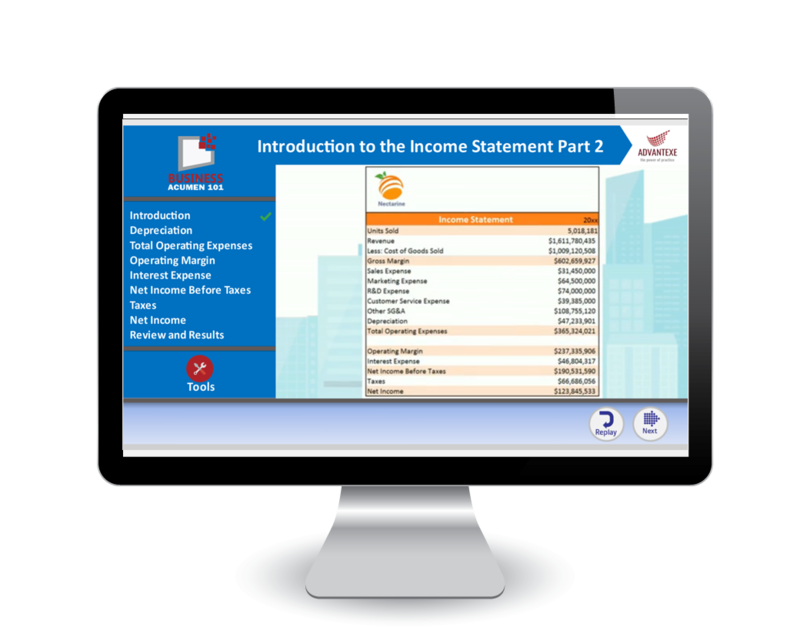 BA101 consists of a portfolio of short, 20-25 minute eLearning lessons, job aids, achievement badges, leader board, and a dynamic business simulation. As users work through BA101, they will be exposed to foundational business content on strategy, finance, marketing and sales. Short assessment scenarios are embedded throughout the learning and focus on real business issues to test the learner's acquisition and application of knowledge in real-time. After the completion of each course, learners receive an achievement badge based upon their assessment score. 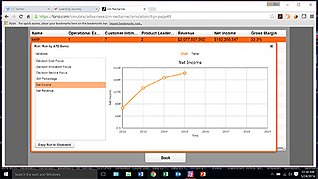 All course scores can also be collected and tallied for access on a leader board. At the heart of BA101 is an interactive business simulation that provides learners with hand-on learning experience. In the business simulation, learners take control of a multi-billion dollar global company and run it for several operating periods. Each simulation round requires the learner to think about business management in a systemic way, where knowledge in the areas of strategy, finance, marketing, and sales are put into action to help learners feel more comfortable and confident with their decision-making process and new language of business. Target Audience - BA101 is designed for any employee in an organization that needs to develop, refresh, improve, or strengthen their business acumen ability and overall business decision making. To learn more about BA101, or to set up a demo, please complete the form below. BA101 provides on-demand access to a series of web-based learning modules and an interactive simulation to allow users to practice and apply their newly learned skills in a risk-free environment.